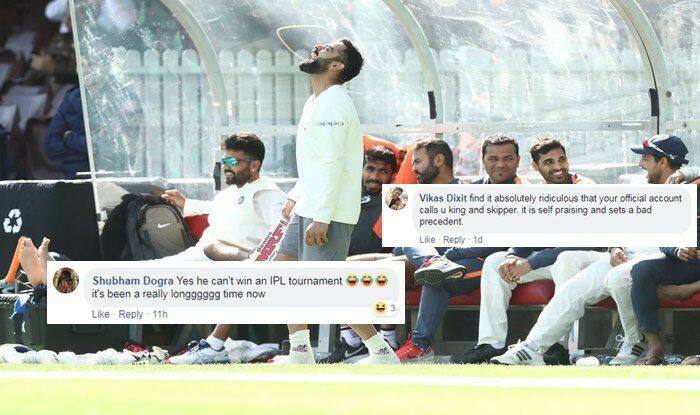 India vs Australia 2018 Tests: India skipper Virat Kohli again became a victim of trolls on social media after he took to his Facebook page and posted the video of the wicket he scalped during the recent tour game. India vs Australia 2018 Tests: India skipper Virat Kohli again became a victim of trolls on social media after he took to his Facebook page and posted the video of the wicket he scalped during the recent tour game. He shared the post from cricket.com.au. He captioned it as, “Is there anything the skipper cannot do?” This did not go down well with his fans who responded saying the Indian Premier League title. As the skipper of the Royal Challengers Bangalore franchise, Kohli has never lifted an IPL trophy and that is something he would like to correct soon. Fans also felt there was no point being so pompous when he has never lifted an ICC trophy or won an overseas series outside Asia. Here is the post shared by Kohli. Here is how he got trolled. “You learn from every series, every tour, every game that you play,” Kohli told Sydney-based Macquarie Sports Radio. “I think from last time round, I’ve become more assured of myself, I don’t really find the need to prove anything to anyone. “It’s all about doing what the team wants me to do and just giving my 100% on the field, it’s a gradual process, I don’t really feel anything different when I go to tour countries now, it’s more a process now,” the 30-year-old added. India’s fortunes will depend a lot on Kohli when the tourists lock horns with hosts Australia for a four-match Test series. Kohli is currently the No 1 batsman in Tests and ODIs and India will hope he gets among the runs. It would also be interesting to see if Kohli can keep a lid over his emotions as Australians are bound to provoke the India captain. Kohli has said that he feels there is no need for him to get into an altercation. The first Test starts on December 6 at Adelaide.